Let me help you make your house your home. From full construction to one room edits, I can help conceptualize, source, specify and oversee installation of everything from the wood trim and tile, or "hard finishes", and lighting, paint, flooring...to furniture, wallpaper, bed linens, pillows and artwork. Maybe you are just looking for some ideas for when you are ready to remodel or refresh. I can meet for a walk-thru of your home and give you an experts opinion on potential upgrades for resell or simpler surface and decorative updates to help enliven your space for a fresh interior. No matter your needs, I am willing and able to accommodate the scope of your project. I'll take the time to listen and feel out who you are in your home to help you make the right choices and spend your money wisely. I can work remotely for you! I have completed many remote design projects (including full bathrooms) and these days, with skype and facetime, it's really quite doable to work on many different kinds of things. From review of architectural plans to real-time rooms, off-site work is doable, affordable and a great way to get extra eyes on your project. 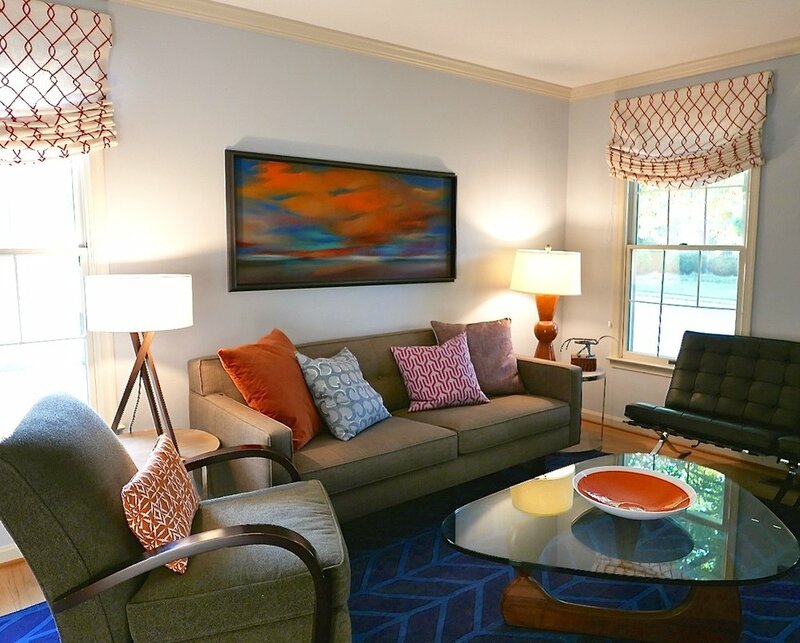 This room was a "one room update", that kept the existing seating, coffee table and painting. 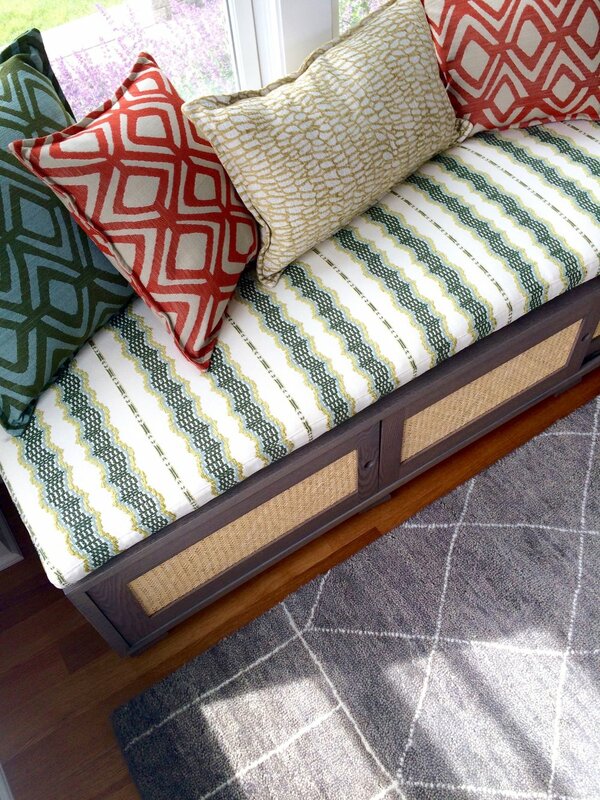 The rest is new and included removal of chair rail, paint, rug, roman shades, pillows, side tables and lamps. The changes made the room really pop (the "before" pic can be seen in the "update + refresh" section on homepage). The clear focal point was the art, so I ran with that. This was an affordable and quick refresh, and even though just one room, it changed the feel of the whole house immensely. Design, Sourcing, Meetings billed at highest hourly rate; Order Processing billed at lesser rate; Delivery, Receiving, Installation billed at lowest rate. Items specified by SA are purchased by SA. Trade net pricing + 20% mark-up on all trade goods. Regular Retail price for non-trade goods; ALL BUDGETS WELCOME and accommodated. Checks preferred, but Credit Card payment optional for minimal fee +/or based on price point. Retainers requested for larger scaled projects. $295 for 3 hour meeting on site to walk your space together, review interiors, hear your wishes, etc. I walk the house for a bit and then present ideas, on the spot, for changes and updates based upon what I hear you are looking for. For some, this may be actual physical changes to interior floor plan for longer term upgrades. For others, it may be just some fresh eyes on what needs to go and what should stay, what could use some updating. This is like a "mini design" session! I follow-up your Walk-Thru with an email of bullet points of what I see for your spaces, vendor +/or product links, and images of some design ideas I referenced and think you should consider. If you really like the results, we could flesh out a larger design plan + project thereafter. Available for remote consult walk-thrus too! "Allie has been great to work with! I live quite a distance from her, and she managed the design work remotely with absolute patience and creativity. My husband and I are newlyweds, and Allie helped us navigate the tricky process of deciding what to keep and what to discard in order to create a cohesive style that both my husband and I would feel at home with. Taking into account our existing belongings and styles, she also encouraged us to step outside our comfort zone a bit and with fantastic results. She provided help with everything from choosing paint colors and silverware to designing built-in bookcases and floor plans. Allie is personable, professional, and absolutely skilled in helping create a home that reflects your style and needs."